Gatyk is thinner in consistency than yogurt and can thus be enjoyed as a yogurt drink (it’s similar to kefir, only gatyk is slightly thicker and not as sour). 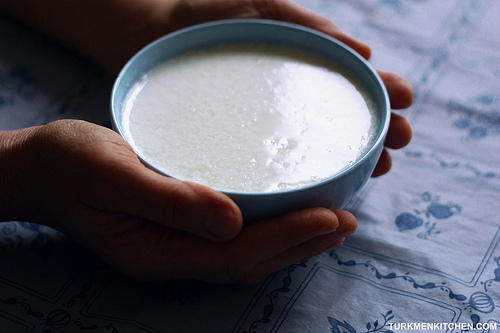 In Turkmenistan, gatyk is commonly used in soups or as a topping for pasta dishes and dumplings. Heat the milk in a saucepan over medium heat. As soon as the milk begins to rise, remove from heat. Allow the milk to cool until lukewarm. Pour the yogurt into a jar. Pour in the lukewarm milk and stir with a spoon. Put the lid on and wrap the jar in a thick cloth. Let your yogurt sit until firm, about 6 hours. Refrigerate. Can I use pasterised milk or does it has to be raw milk? It is not specified in the recipe. Thank you. Raw milk would be better but it will work with pasteurized milk as well – that’s what I used in this recipe.